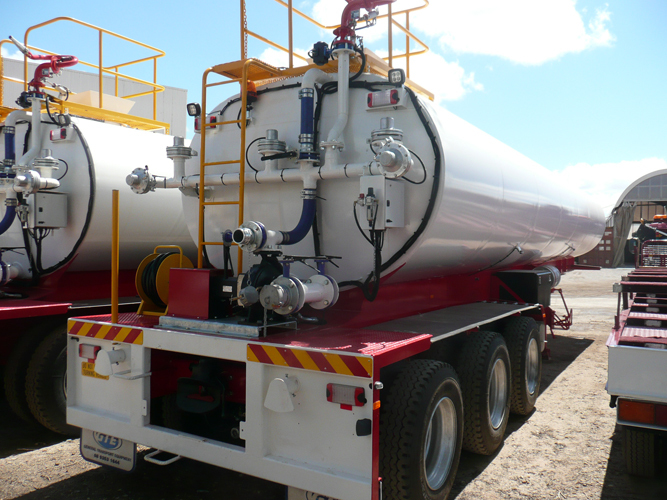 Perth based custom transport equipment manufacturer, General Transport Equipment (GTE) designs and builds water tankers for a range of commercial and industrial applications. 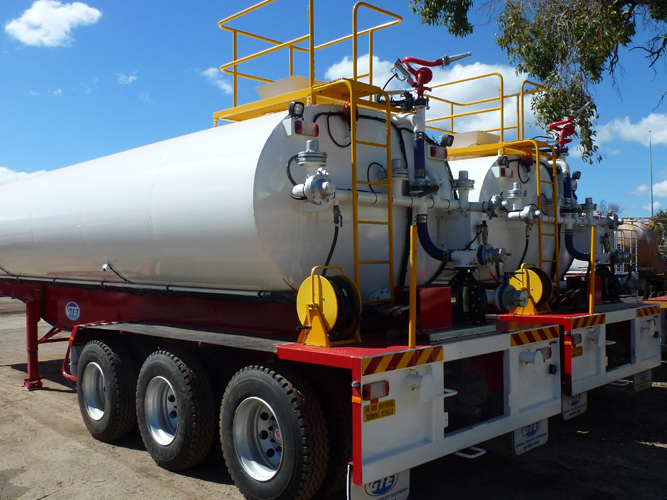 The tankers, for water and other non-dangerous and non-corrosive liquids, are custom made to suit specific load requirements, client specifications and road conditions. They meet all Australian design and safety standards, with robust construction for long operational life, and are able to handle high liquid volumes. 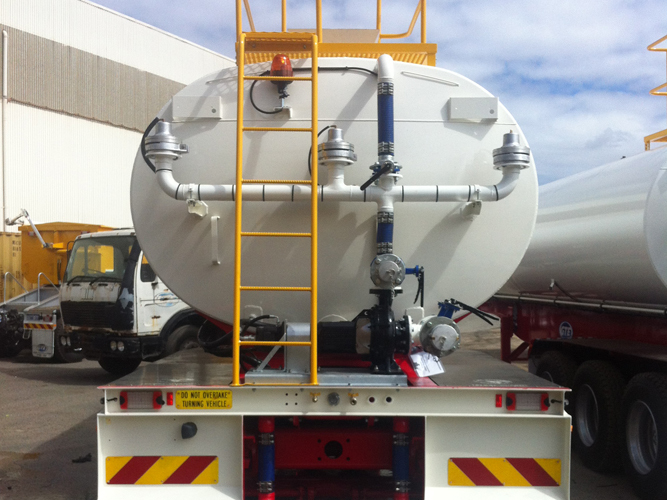 Design and manufacturing options are dependent on use, however construction materials available for water tankers include steel, stainless steel, fibre glass reinforced panel or aluminium; with several axle options and top of the range suspension systems. Where applicable, GTE offers Electronic Brake Stability (EBS) as the highest standard available. We can also fit spray systems, hydraulically driven pumps and features including hand rails, overflow valves, dribble bars, wash down hose and reel and inlet/outlet connectors for road trains. Choose GTE’s experienced team for all your transport requirements including water tankers, semi trailers, fuel tankers, end tippers, side tippers, rigid tippers, converter dollies and platform trailers. We are a leading West Australian transport equipment manufacturer and supplier with an in house engineering department incorporating the latest technology and providing excellent customer service. We have full service capabilities including licensing and approvals. Contact us today to find out more about water tankers for your commercial or industrial application or get a quote for our quality transport equipment. Call us on 08 9352 4000 or fill in the online enquiry form. For customised trailer solutions, including dolly converters, multi trailer combinations, flat top trailers, fuel tankers, chemical tankers, end tippers, side tippers,and truck trailer parts, trailer repairs or servicing, please contact GTE on 08 9352 4000. General Transport Equipment (GTE) is a leading supplier of customised transport equipment and services in Western Australia. With a professional and client focussed approach, GTE provides highly customised trailers, semi trailers, chemical tankers and rigid truck bodies, which are tailored to suit specific load requirements, client requests and road conditions. 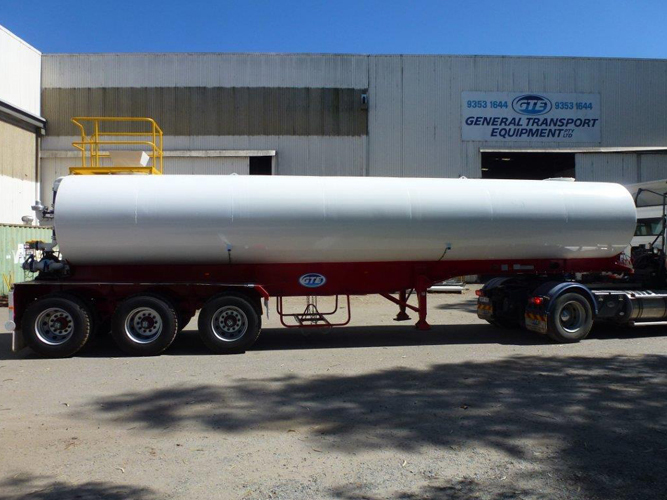 GTE provides quality equipment and services for every major form of medium to heavy transport in the rural, general freight, chemical tanker and mining industries.